1935: An entrepreneurial politician files a patent application for a device that will elicit curses and contempt from generations of motorists: the parking meter. If it weren't for Pearl Harbor, FDR might have called May 13 a day that will live in infamy. 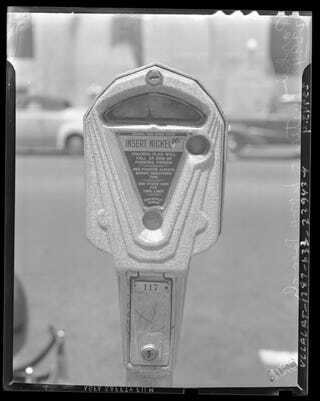 It was 75 years ago that Carl C. Magee of Oklahoma City sought a patent for the world's first parking meter. Many will come to see the invention as a bane of urban living. Soon after Magee filed to protect his intellectual property, the world's first installed parking meters were put into nickel-gulping service right there in Oklahoma City in July 1935. Your five cents (about $.80 in today's money) got you anywhere from 15 minutes' to an hour's worth of parking, depending on location. Some would say things have been going downhill ever since. Who among us has not realized a minute too late that we forgot to feed the meter, or been walking back to our cars on a beautiful spring day just in time to see a ticket being slapped onto our windshield? What prompted this seemingly fine upstanding lawyer, newspaper editor and occasional senate candidate to come up with his infernal device? He was appointed to the Oklahoma City Chamber of Commerce traffic committee, and then he was assigned the task of solving downtown parking problems. Even back in 1935, U.S. cities were having thoroughly modern problems: Workers parked on downtown streets and stayed all day. That left few spaces for shoppers and others who visited the central business district. Magee's brainwave was to install a device that had a coin acceptor and a dial to engage a timing mechanism. A visible pointer and flag indicated the expiration of the paid period, meaning you either had to move, put in more money or face the wrath of the local constabulary. The design continued largely unchanged for more than 40 years. Carl Magee's new parking meter not only solved Oklahoma City's parking problems, it also got a new revenue stream flowing in to city coffers. Magee mentioned money in the patent application for "meters for measuring the time of occupancy or use of parking or other space, for the use of which it is desirous an incidental charge be made upon a time basis." U.S. Patent No. 2,118,318 was granted for the device May 24, 1938. The idea spread to other cities around the country and the world. Magee managed to make money manufacturing meters and selling them to many municipalities, starting at $23 a pop ($365 in current cash). No one seems to like parking meters, but they do serve their intended purposes of controlling parking and generating revenue. On top of that, they provided the central plot point for Paul Newman's 1967 film Cool Hand Luke. Newman's character Luke Jackson, was sent to a chain gang for drunkenly cutting the tops off several parking meters. Photo: A circa-1940 parking meter in Long Beach, California, proclaims itself an "original Carl Magee meter."